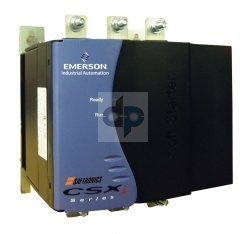 The CSXi series features the functionality of the CSX compact series starters, plus motor protection and current limit and current ramp starting modes. The CSXi series soft starters by Saftronics offers one of the smallest footprints in the industry, and features a bypass contactor, ideal for non-ventilated enclosures such as MCC installations. The CSXi series is a closed-loop (constant current or current ramp) controller that provides for soft starts and stops for squirrel-cage type induction motors from 5-200 horsepower. The CSXi is well suited for high inertia loads and loads where starting load torque is fairly constant. The CSXi is adapted to receive Modbus, Profibus, and DeviceNet fieldbus communication modules, which can be snapped onto the side of the CSXi module. The CSXi can operate on input voltages from 208-480 VAC (+/- 10%). The CSXi features relay ouputs and 4-20mA outputs.